Long sleeve ivory top with a slate blue striped design and grey accents! This top the perfect for your everyday occasions! Fit: True to size w/ some stretch. Kelli Hoffmann B. Reviewed by Kelli Hoffmann B. Simple, cute, and lightweight sweater. Perfect for transitioning to spring. Ashley K. Reviewed by Ashley K.
I love this sweater. It's not too heavy but warm and comfortable. 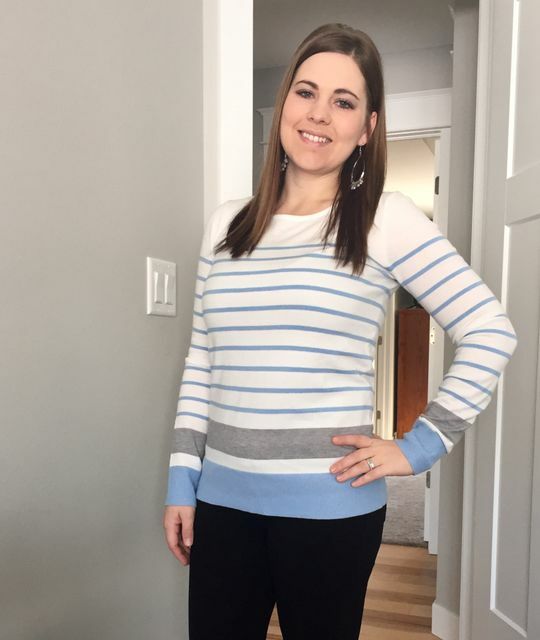 Brooke K. Reviewed by Brooke K.
This sweater is absolutely amazing! Super soft. Absolutely LOVE it! Brittany R. Reviewed by Brittany R.
This sweater is nice and soft. The blue stripes are such a pretty light blue. It runs true to size, and isn't too short. I like my tops long enough to cover my waist, and this one does.